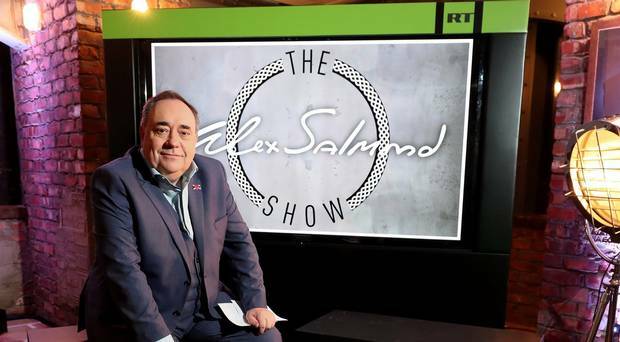 Does it matter very much that Alex Salmond has chosen to appear on Russia Today (RT)? No. I sometimes glance at this site. It has a perspective, but then again so does the BBC, CNN and the New York Times. RT has a Russian perspective. It’s not a perspective we often have access to in the Western media, so in that sense RT can be useful. I find some of its reporting and opinion pieces to be very biased, but others are no worse than what we get in British newspapers or television. But then every story on every website has to be evaluated critically. The important point to remember is that RT is funded by the Russian Government and it has a goal. This goal is to further the interests and foreign policy objectives of Russia. Does this make RT illegitimate? No. The BBC World Service likewise has a goal. Do you think that we fund radio programmes in obscure languages out of the goodness of our hearts? In Britain too I find that the BBC has a perspective that it relentlessly pushes. It is most often very fair and balanced in its coverage of politics, but at the heart of it all is political correctness. Most people, perhaps nearly everyone who works for the BBC believes in this or at least won’t question it. I doubt it would be possible to get a job if during an interview someone expressed doubts about aspects of feminism, gay marriage or climate change. So while it is possible to describe much of the coverage on RT as propaganda, so to it is equally possible to describe the BBC. But why would Alex Salmond choose to appear on RT? It may be chance. He may simply have received an offer from the Russians. He lost his job earlier this summer and has the right to work where he pleases. But it might be worth reflecting for a moment on what he is doing. During the Soviet Union various Labour politicians and Trade Union leaders made trips to see how socialism was working out. Many of them went to see a collective farm and reported back on how wonderfully it all was working out and how progressive and efficient it all seemed. When travelling around the Ukrainian Soviet Socialist Republic in the 1930s they noticed no famine, nor in other parts of the Soviet Union did they notice any repression. This continued right up until the end of the Soviet Union. Various Labour politicians and trade union leaders supported Soviet foreign policy goals, such as nuclear disarmament and in return were given money by the Soviet state. The Soviet Union was Britain’s enemy all through the Cold War. The greatest threat to our existence came from Moscow. We also, of course, were a threat to them. But let’s be clear. There is a word for siding with the enemy during wartime. I think the West has made a terrible mess of relations with Russia since 1991. We have pushed the EU and NATO right up to Russia’s border and crossed Russian strategic red lines. There was a chance back in the early 1990s to include Russia in NATO and give it some sort of EU membership. We could have had a relationship of cooperation and friendship, but chose instead to continue the Cold War rivalry. No doubt the Russians were to blame also. The Yeltsin years were humiliating. Russians may have been treated with some friendship, the Americans even sent aid, but they were also treated as if they were all useless, second rate drunks. The financial crisis of 1998 showed that democracy and free market economics could lead to poverty. In order to avoid further descent they turned, or rather returned to the familiar pattern of leadership. Putin has brought Russia back to being something close to a great power again. But in doing so he has come into conflict with the West. He has become our enemy. The final straw for the Russians was Ukraine. Just as the Americans would not allow missiles to be sited in Cuba, the Russians could not allow Ukraine to join the West. They fought to stop this and they won. But in return the Americans deliberately set out to wreck the Russian economy and achieved that goal. The rouble fell like a stone in 2014 and sanctions had an effect on the living standards of ordinary Russians. But at the same time Russian foreign policy was succeeding. Their intervention in Syria while brutal was the key to defeating ISIS. Russian intelligence actually understood what was going on because they had been in Syria for decades and spoke the language, knew the history and understood the differences between the people there. The CIA as usual understood nothing. So not only is Putin an enemy, he is a dangerous enemy. His intelligence services are rather good and his military forces are superior to anything we can put in place. If Russia wanted to annex the Baltic States, it could do so almost instantly and there would be nothing we could do to stop them except drop nuclear weapons on Moscow. The Russians didn’t take kindly to having their economy wrecked. Moreover they didn’t take kindly to how the West once more made a mess of the Middle East by first encouraging revolt in Libya and by means of that example enabling chaos in Syria. They were right of course. It is for this reason that the Russians are out for revenge. Naturally Alex Salmond understands none of these things. He is bumptious, fanatical about Scottish independence, but not very bright. Putin like every other leader in history has made mistakes, but he is conducting foreign policy in a very clever way. Russian interests are being advanced, Russian power is being increased. Above all he is attempting to weaken the West. One way in which the Russians are attempting to weaken the West is by encouraging secession movements abroad. The Russians have a rather paradoxical attitude to secession. It’s fine when it’s in Russia’s strategic interest, but otherwise it is forbidden. Thus Crimea is allowed to secede from Ukraine, but any attempt by Chechnya to secede from Russia will be crushed by force. Because Russia will crush by force any secession movement at home, it feels free to encourage, for example, the Catalans in their attempt to secede from Spain. Spain, of course, is not exactly an important military power anymore and hasn’t really been since it lost its fleet in 1588. Britain on the other hand is rather more serious. We have nuclear weapons and we still have reasonable armed forces, despite David Cameron’s attempt to all but disband them. Long term Mr Putin is trying to weaken the West and weaken NATO. What better way to do this than see Britain’s armed forces neutralised. If that happened in conjunction with renewed American isolationism, then NATO would cease to be a serious force. It would be left with the Germans and the French. At that point a dash from Smolensk to the Baltic coast in order to get back the Baltic States looks feasible. So it isn’t accidental that the Russians would want Mr Salmond on their television screens. Mr Putin is happy to stir up trouble in Spain. He will give money, he will use the IT skills at his disposal to help the Catalan secessionists. It will be difficult to prove anything. Were the Russians really involved in the US Presidential Election? Did they interfere with the French presidential election? Who can say? But whatever they are doing they are doing it for a reason. They want to increase Russian power by destabilising the West. Is Russia our enemy? Yes. I wish it wasn’t, but Russia is acting towards the West in general like a hostile power. I believe we should make peace with the Russians. Make a deal over Ukraine. But until that happens we are in the midst of a new Cold War. What is more Mr Putin has electronic means that were unavailable to his Soviet predecessors. So the Russians will give Mr Salmond a platform to preach secession. If he was a leader of a Russian Republic they would kill him for doing so. But that’s OK he is only trying to harm Britain. If he could only succeed in breaking up Britain Russia would have one less enemy to worry about. Mr Salmond will probably do little harm. I can’t imagine many people wishing to watch his programme. But let us be clear, by taking Russian money and using it to peddle propaganda that the Russians are sympathetic too, he is acting in a rather ignoble tradition. For long term strategic reasons the Russians would love to see the UK broken up. Russia is acting as a hostile power and is a strategic threat to our allies in Eastern Europe. Anyone who does not recognise this threat is simply uninformed. In any future elections the Russians are liable to take the side of those who hate Britain. They may try to interfere in our democracy too. Perhaps they already have. We must be clear about this. We look back on those who took Soviet money or who failed to see the awfulness of the Soviet Union as naïve, deluded fools or worse. Taking Mr Putin’s money is no better. Your piece shows an understanding of Russia and its leader and of Salmond as useful idiot. I always love reading your stuff Effie - I totally agree with this, but am just interested in what you think re alleged Russian role in whipping up support for Brexit. Is the collapse of the EU not also what Putin wants? Effie is OK with Russian support for her causes e.g Brexit or when Putin asked to intervene in Indyref by Cameron. Such treason and treachery! But about 3 people will watch it so why are we bothered? Let him fulminate against the nation of his birth from Pravda TV (we have ways of making you watch!) if he likes. He simply damages the cause even more, whatever 'cause' is left. I wonder if the Russians will air a TV show hosted by his fossilised skeleton when we finally get round to having indyref2, the action packed sequel to indyref1? Might be an idea to look again at the chronology of Spanish power. Verb. sap.